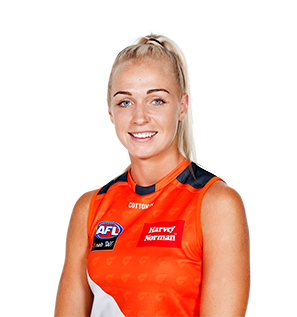 Nelson Bay product Pippa Smyth will make her NAB AFL Women's debut when the GIANTS take on the Crows at Blacktown International SportsPark on Sunday afternoon. Pippa Smyth is a powerful and athletic key position player hailing from Nelson Bay on the north coast of NSW. Since crossing from netball three years ago, she has continued to develop her footballing skills and has developed a strong overhead mark. Playing in the Black Diamond Australian Football League, Pippa impressed with her performance at the GIANTS’ AFL Women’s testing day which led to a call up to the NAB AFLW Draft Combine where she impressed, finishing first overall in the 20m sprint. Usually plays in the ruck but can play in key positions or on the wing given her elite fitness gained from her job as a personal trainer.